A beach vacation or a waterway family get together is enjoyable. But if you are thinking of adding a little excitement to the event, then you should be thinking about renting a personal watercraft like a jet ski. Okay. Let us say you have currently planned out every little detail and you are just adding some activities for your holiday. You are currently looking for a place to get jet ski rentals. There are several possible areas to look at, there are at least two practical places to start searching: the internet and the very same hotel or park where you will be staying. Basically, if you are putting together a plan of activities, there are options where you can include jet ski rentals in Myrtle Beach. These might be done online or offline. There are rental websites online that where you can find available jet skis you can use for a specific period with a fixed rate. Renting from particular websites will also allow you to use the jet ski for the whole day. You can likewise have a trailer and also a tie-down at an additional cost. These websites can also offer various other individual boats, not just jet ski. You can also look for the availability of jet skis once you show up in Myrtle Beach. Typically, coastline resorts, as well as other parks, have available jet skis for you to rent. Leasing in these places is more limited and also they generally rank their rentals on a per hour basis. Obviously, the freedom to choose between these two alternatives is completely yours. You need to keep in mind that when you lease a jet ski, you are bound by rules which resemble leasing a car. The only difference is that jet ski rentals have safety equipment included. Included in the rental fee is the equipment you would need when you are making waves either on the ocean blues or on the waterway. To avail of a jet ski rental in Myrtle Beach, browse through the numerous websites on the internet and ask about how you can get rent their jet skis. You could likewise call or email your hotel or condo management company or the place where you will spend your vacation for the availability of jet ski in their place as well as have it as an add-on. 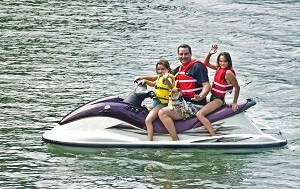 Action Water Sportz provides jet ski rentals in Myrtle Beach at three convenient locations. Call us today to discuss your vacation plans and how a jet ski rental could be the highlight of your vacation.